In spite of the gloomy state, we saw promising opportunities. We spent countless months exploring products and consulting ideas before finally settling on launching a consulting company that specialized in Enterprise Information Management. All the above reminded us of the mid-1990s when the ERP market had several vendors trying to solve different parts of the problem. The 1990s saw an exponential growth in the area of ERP business and we anticipated a similar future in the area of Unstructured Data Management. Since then, it has been an exciting journey. Our strategic bets have proven to be correct, and as a result, we are enjoying significant client relationships, solving critical problems, and enjoying healthy growth. I would like to personally thank our friends, customers, and well-wishers for having the trust and faith in a small group of people with big ideas. We would like thank the employees of Netwoven for trusting a promising startup and partnering with us to see the tree blossom and bear fruit. We would also like to take the opportunity to thank Dan Rosman, VP of IT at Jelly Belly Candy Company, for putting his trust in a company comprised of only two people to help shape their Business Intelligence system using the newly launched Microsoft platform. Stay tuned for the launch of our new website using SharePoint 2013 with new and expanded services. 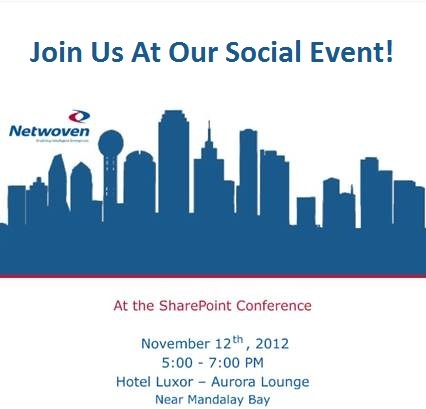 Netwoven is pleased to participate in the SharePoint 2013 conference in Las Vegas, NV. Join our party at the Luxor’s Aurora Lounge and meet the Netwoven experts. This is our last newsletter for 2012. On behalf of Netwoven, we would like to wish you a happy holidays. Is SharePoint 2013 ready for prime time Web Content Management (WCM)? You be the judge!